Was the High Cliff Cougar Shaped by the Hand of Man? In the eight years since discovering the Cougar, two significant events altered my perception. The first was surviving two heart attacks, which effectively ended my walking in the Valley. The second was meeting Bob Miner, who read my partial manuscript of “Walking” and invited me to take a little stroll with him, ‘cause he had something to show me. The “something” was a series of astonishing animal effigies and stone chambers made by the Indigenous peoples. The majority of us refer to the Indigenous People as “Native Americans”. Perhaps I have been learning too much from my Narragansett friends, but they make a good point: The Narragansett are Indigenous People, perfectly matching Webster’s New Collegiate Dictionary’s “definition #1: Having originated in and being produced, growing, or living naturally in a particular region or environment”. Long before Amerigo Vespucci, the Italian Navigator who loaned his name to the new continents of the “New World”, North and South America, from which the term “Native Americans” is derived. I use both terms interchangeably, but I wanted you to know that “Indigenous” has a following. But I digress. The Narragansett artifacts I saw were so remarkable, I knew during the walk with Bob that somehow I was going to have to finish “Walking Together In Tomaquag Valley”, and expand it to include a walk entitled “Seeing The Native American Presence”. I simply HAD to teach others in that book how to “see”, just as Bob taught me. After six months of conditioning, in June of 2012 I was back at it, mapping and collecting GPS data, and writing about what I found. Relief” carving and shaping of it’s stylized eye. This eye was well executed. would “waste time” doing something that didn’t produce food or shelter. It was just a day or two after recognizing that there was nothing crude about the sculpting details of Turtzilla that I ran across the close up photo of the Cougar, and it hit me that maybe the Cougar was also sculpted. I called Lauri with urgency in my voice, came over to her home and punched up the close up of the Big Guy, with the now famous question: “What if it’s man made?” I have never seen Lauri just sit, silently staring at her monitor for at least 5 minutes. All the details of the next five days are in the book “Walking…”. are not a normal occurrence in nature, yet the Cougar has four different radius Arcs used in it’s precise construction. The tangential blending of the eye socket into the forehead curve is learned in a High School Geometry class today! 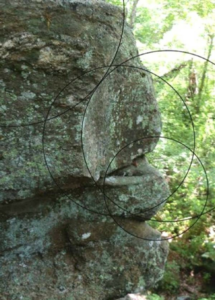 Few archeologists will risk the peer pressure to acknowledge the Indigenous People used Geometry, but no farmer would make the colossal effort and “waste” time making something that for him was useless. However, the Narragansett were a “Spiritual People”. The Cougar is in harmony with their theological view of the world, and for them, the monumental Cougar sculpture was part of a major Spiritual Landscape. The next day I found a simple way to get video footage of the Cougar which I hoped would establish my belief that the Cougar WAS shaped by the hand of Man, specifically an Indigenous Person. 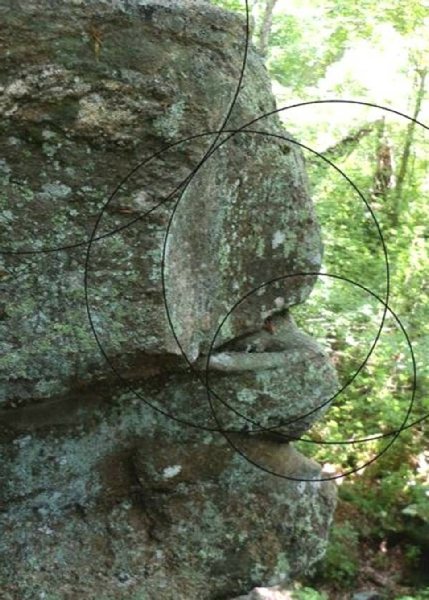 Please follow this to the next drop down where the video recordings reveal “The Man”, and a complete circle proves the case that indeed, the High Cliff Cougar WAS shaped by the hand of man. 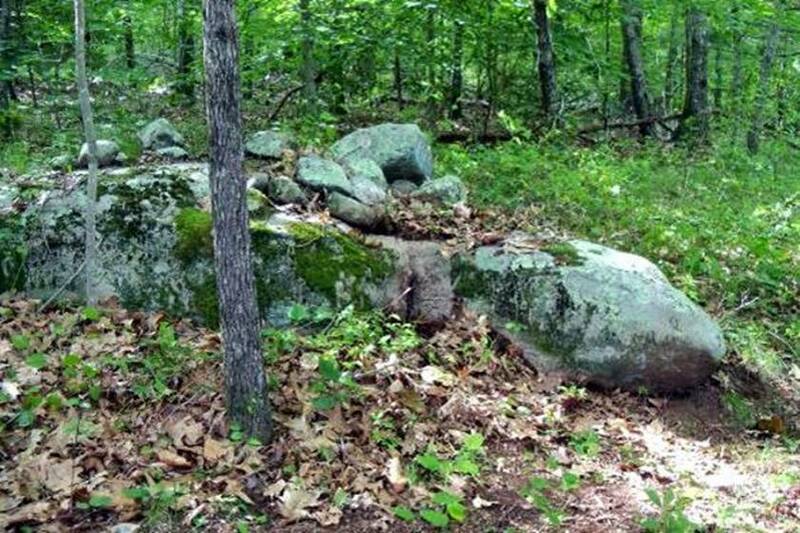 To give you an idea of how rare, and archeologically important Hopkinton’s Cougar is, ask yourself where the next closest Native American Monumental Cliff Sculpture is located? I’ve heard a lot of talk, but I have yet to see any documentation like what you see here. There must be more, but where are they? These are FICTIONAL walks through Time, three to the past, one to the future. They are based on Artifacts, Features and Locations in Tomaquag Valley. However, now we are moving into a different aspect of our Web Site. In this wing of our History Library, and for this set of four in particular, you are entering the world of Historical Fiction. The question is no longer “What”, but “Why”, “How”, “When” and “Who”. The “4 Pack” stories are arranged chronologically. They begin with the pure Indigenous era of “Sunrise Barrow”, set in the time before the first European contact. The next explores the era of “Contact”, as the Narragansett faced the monumental change of thousands of Europeans swarming inland from coastal enclaves. The predictable result was a rapid shift from thankful dependence on the Indigenous People by the Europeans to open warfare between the expanding Colonizers and the dismayed Indigenous Peoples, called the “Pequot War in History. Then, within fifty years of the founding of Plymouth Colony, came a second wave of warfare against the Indigenous People, called “King Phillip’s War”. This is an historical event that remains unknown to the majority of European descent, yet retains strong ramifications among the Indigenous People nearly 350 years later. This war is the “500 pound gorilla in the room” which dominates the story “The High Cliff Cougar”. In the third story, “The Happy Girl”, the cultural / political landscape has been drastically altered by the aftermath of “King Phillip’s War”. I take you to each of these four cultural landscapes, each vastly different from the other three, through the freedom of imaginative fiction, to create a sense of “Why?” for these places. I remind you that these stories are Fiction, plausible imaginative conjecture. As each of them deals with events which remain emotionally charged to this day. I have labored for accuracy in my stories, seeking input from the Narragansett Community and Colonial Historians to widen my eyes and increase my knowledge of these times. Yet I know that perfect harmony across the full spectrum of opinion divided in the Past by War and it’s aftermath, and in the Future, by different mutually exclusive Priorities, realistically is not possible. It is not my purpose to offend or delight either end of the spectrum of opinion, I write the best History I can, even in fictional settings. However, if the historical fiction resonates with you, I urge you to enter the open door of your own curiosity and explore the many books and Internet sites which present these times as serious history, rather than grammar school mythology. In particular, I again emphasize that without accurate knowledge of “King Philip’s War”, you are operating with childish illusions and fairy tales regarding the events that occurred on the ground where you live. I make four recommendations to you for suggested reading. The “High Cliff Cougar” and it’s companion “The Man” are part of a remarkable “Monumental Sculpture”. 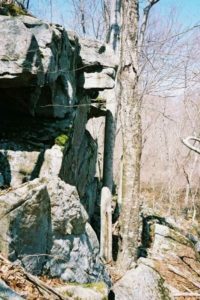 Both are located on the same block of rock , which juts out from the top of a 22 ½ foot perfectly vertical cliff. The sculpted block is 6’ high and protrudes 4’ out of the cliff, overlooking a flat plain about 50 feet below the cliff top and it’s jumbled talus slope. Throughout the book “Walking Together In Tomaquag Valley”, I stress the need to keep a “Wide Eye”. You have to make a conscious effort to get your eyes up off the ground and look 360° at your surroundings. The High Cliff Cougar discovery illustrates why. When I began mapping and collecting GPS data of Tomaquag Valley in 2003, I was at this cliff, one of at least six besides the “Indian Shelters” located off the rusty ‘bar way’ on Maxson Hill Road. The “Indian Shelters” are located near a road, the other 6 cliffs are much deeper in the valley, assessable only to hikers. I recall I ate lunch on a big stone block resting on the cliff top, and had been all around the cougar, even taking photographs of it, but never “saw” it. The Cougar & The Man have a remarkable ability to disappear unless you are looking at the exact spot at the right time. In 2003, they were hidden from me, as I was intent on covering a large area for my maps. That is the sculpted block circled in red on the upper left. Do you see anything remarkable hiding in there? Nope, me neither. In 2004, when I was photographing various walls, locations and Colonial ruins as material for writing “Walking Together In Tomaquag Valley”, my eye was not locked to where I was placing my feet in the woods, I was looking around for “the good shot”. Only then did I see the big guy. My photography training made me wait 90 minutes for the sun to move across the sky to give me the dramatic Shadows that make the High Cliff Cougar leap out from the lifeless rock and sink into your imagination. Give the picture some time for your eye to adapt, and then say hello to the nice kitty. So you have an idea of the scale, my brown walking stick resting on the tree is 5’ tall. Hoo-Ray for zoom lenses, because if you look around in both of those two pictures, you can see the terrain is a large bolder talus slope jumble, and besides worrying about falling off the cliff, you can slip into a deep crack covered over with leaves and easily break an ankle. As 95%+ of my mapping was done alone, crawling out of the Valley is not an item on my bucket list, so I was very careful of my footing. I got to a place for “the Good Shot”. It was mid April, and the tree buds were ready to burst with 2004’s new crop of leaves. There were no clouds, and the warm sun felt nice, even though there was still a chill in the air. If you stood around, you would say it was cold. But I was busy catching the Cougar on film. In the year 1669, the town of Westerly was in its infancy. The Town Council records refer to what would become Hopkinton as the “vacant lands”. The area was in turmoil, for although the white man had legally purchased land from Native Americans, neither party realized what the consequences would be. In 1675, after seeing their hunting and fishing grounds, as well as their cornfields taken over by the white man, hostilities erupted and in June 1675 King Philip‘s War broke out. Named after the recognized leader of the Indians, Metacom or Philip, as the white man called him, it was to be the bloodiest battle in the Colonies history. By August 1676, the end of the war, 600 Colonists had been killed along with 3,000 Indians. King Philip’s War, (Please Google it.) eradicated most Native American tribes in southern New England. The war opened up the “vacant lands” in Hopkinton, and slowly the white man moved in. And here we are today, with many races now living peacefully within our continuing to change Town. For the past fourteen years, on a daily basis, I have had the opportunity to read through the old Town Council records in Hopkinton. I have entered all my notes into my laptop and divided them into categories. Each quarter, January, April, July and October, I choose a subject from one of those categories and write a story for “The Notebook”, the Hopkinton Historical Association’s newsletter. (Anyone is welcome to contribute an article on a Hopkinton subject for publication.) The “Notebook” was so named for my little notebook I carry in my purse and use frequently to write historical “tidbits” in. The “Notebook” made its HHA debut in April 2010, and has evolved into eight pages of historical information from the settling of Hopkinton, old roads, wars, why “things” happened, old pictures, and many other subjects too numerous to list. A Wells Family History & Uncovering The Facts. There has been little written about the Wells Family of Hopkinton and Rhode Island in general, but what had been written has had no facts to support the claims. I have spent the last 16 years compiling data on the Wells family, concentrating on Hopkinton town records. I intend to publish a book on the Wells family within the next five years, which will include the Thomas Wells line and the Peter Wells line. I welcome anyone to contact me with family information to share. In this article I want to dispel several myths concerning this family and more importantly, share crucial information to correct an incorrect line, which people will be grateful for or will ignore. Nathaniel Wells is a myth. It has long been tradition in the Wells family and in the Town of Hopkinton that one Nathaniel Wells, a ship builder from England, was the progenitor of this family. I have been corresponding with Mr. Orrin Wells of Kent, Washington, who has delved deeply into his family genealogy. Both of us have studied the Nathaniel Wells story extensively and feel, without a doubt that an Albert Wells was the perpetrator of the flawed early history of the Wells Family. With the resurgence of genealogy in the mid-twentieth century, individuals became very cognoscente of the fact that many of the nineteenth century genealogies were much embellished upon. “Nathaniel Wells was born ca 1600 in Colchester, England. He was a brother to Deacon Thomas Wells of Ipswich, Massachusetts and Richard Wells of Salisbury, Massachusetts. He was also brother to Hugh, Joseph, William and George, who were the sons of Thomas Wells (1566-1620) of Colchester, England. For generations these stories have been taken as fact and must treated with much skepticism. Upon conducting a reasonable search of Massachusetts and Rhode Island records, there is no documentation to support this claim, nor is there any circumstantial evidence. Where did these stories originate? After several family members had researched the family, the stories seem to originate with Albert Wells. In his writing, Albert Wells does not cite any sources and does a great injustice to the Wells family by fabricating such stories. In 1859, J. L. Spencer published bits of folklore in the Narragansett Weekly, which unfortunately have been proven incorrect by people researching their families using his information. His source for the Wells family seemed to be articles published in 1846 by Albert Wells and other family members, again with no sources cited. Today’s genealogists are well aware that embellishing on family connections was popular in the late nineteenth and early twentieth century. If Nathaniel had owned extensive shipyards in England, he would have been an educated man. Upon arriving in America, he would have, with certainty, become involved in the affairs of the town in which he settled. There is no evidence that Nathaniel took part in the political life of any town in Massachusetts or Rhode Island. He is not mentioned in early Ipswich, Massachusetts town records, land records or probate, during that time period, or in any of the surrounding towns. Another popular tradition is that Nathaniel moved to Rhode Island ca 1640 and settled in the wilderness with his family. After studying land evidence records and vital records between Ipswich, Massachusetts and Rhode Island, there is no evidence to support this theory. A Thomas Wells is the first of any Wells family to move to the Westerly-Hopkinton area. In 1677, Thomas Wells, acquired land in Westerly, most likely being lured here by the shipbuilding opportunities on the Mystic and Pawcatuck Rivers. There is no doubt that Thomas Wells (born ca 1626) knew the carpentry and shipbuilding trades well. Family tradition also states that several members of the Wells family wish to be interred in their family cemetery called, “Chimney Orchard.” Upon reading documents and wills from the Westerly and Hopkinton area, the name Chimney Orchard is never mentioned. **Frances Manwaring Caulkins was a local historian in the Stonington/New London, CT area. She devoted many hours to collecting data on the early settlers from old town records. The low opinion of Brabrook was shared by others. Robert and Anna Cross also called him a liar and the Foster family accused him of selling them a drowned heifer which had been dead three days and created a stench. The couple also reported that Brabrook and John Bayer came to their farm and told them that “when Thomas Wells had written the lease between them [Brabrook and Bayer] for Wells’ farm, he had written what he pleased and left out what he pleased and when he read it, he read what he pleased.” Wells was found guilty of slander and required to make acknowledgment in court. At the next court, in November 1668, it was Robert Cross who sued Thomas Wells for slander. Wells had said Cross was “a cheating knave and he [Wells] should have as good trading with the devil as with him and better, too.” Cross won and Wells had to make a statement in court to clear Cross’ good name. “The Major Denison was disgraced at the court in Boston…the members of Boston court gave him a sharp reproof and the Major Denison was not respected in the court of Boston and Goodman Cross said that there came more appeals from the Ipswich court than any town in the country…and the seamen that belonged to our ketches said that Goodman Cross told them that his sons were set in the stocks and punished for nothing and he told us that the major could not abide him and therefore I fare the worse in the court and my sons also were punished for a matter of nothing. “The magistrates sat between the court at dinner drinking burnt sack and when they came into court they were ‘broshing,’ looking as red as though they were flustered and acted as though they were all ‘fodeeled.’ To which his father (Stephen’s father Robert Cross) replied it was the fines they took that fed their fat sides and the father further said that ‘I looked so big and spoke so sorely’ that he made the court quake. Robert Cross, Jr and John Bayer testified to even more scandalous words, that Wells claimed he could “set spells and raise the Devil, he affirming himself to be an artist.” Bayer and Marshall reported some fairly juvenile behavior by Wells, relating that one day when they were passing Goodman Brabrook’s, Wells wiped his feet on sheets that were hanging on the fence rails. It has been the pleasure of God to visit my wife with sickness near unto death and other troubles which I never was tried with all before…we both can affirm those things spoken against the magistrates by those persons…we have sinned against god and his people because we had not revealed it sooner…some have said for Christ says he loveth father or mother more than me is not worthy of me and we apprehend this to be the case…we had rather suffer with good conscious than not to suffer with an accused conscious. We are much grieved and troubled that such things should be laid to their charge…about two years ago and (a) half they lived about two miles from us…we never found nor understood anything in their speeches or behavior but that which was good and Christian like, and ever since last April they have lived amongst us…in his discourse being apt to speak or make occasion to discourse of religion and the best things. Among those he hath lived for the most part of the 8th or 9th year of his age till now; …the good commendation given of him by several in whose families he hath lived, to be an orderly person of quiet disposition, not given to bare anger or a spirit of revenge in labor diligent, dutiful to his parents as they affirm;…Thomas Wells hath often spoke in his commendation [of Benjamin]…now since the court held at Ipswich…Goodman Wells hath given out threatening words against both his brothers both Edmund and Benjamin. As for my son Benjamin we never knew him given to malice or revenge in all our lives: not to speak reproachfully of magistrates or of any other: and as for Goodman Cross we have lived by him many years and never heard him speak ill of authority or against any magistrate but as for our daughter Naomi we do think in our very hearts that certainly in her heart she hates her brothers both Edmund and Benjamin though we speak it with grief of heart, for she would often revile Benjamin and call him rogue before our faces…I told her that I had been in the church of Salem 30 years and upward and never was so detected as your father and I am by you our one child. Thomas Wells took the Oath of Fidelity to the Colony at Westerly, 17 September 1679. At the same time of his removal and settlement at Westerly, it encompassed Charlestown and Hopkinton. He lived in the Hopkinton portion the residue of his lifetime. The supposed location of his home was in the village of Ashaway and later generations built their homes in the vicinity of the Wellstown bridge on the road from Hopkinton City to Ashaway. ___ ___ my daughter Sarah Wells and son John Wells and my son Nathaniel Wells have had their portion in what small matters I had. Whereunto I set my hand and seal the date December 27, 1699. In the name of God amen be it known to whom it may concern that I, Thomas Wells Senr, being neer death doe commit my soule to God and my body to my creator and to my deare beloved wife I doe make her executor of what estate I leave during her natural life and at her despose. And further I doe desire that my son Thomas Wells and my son John Wells and my son Nathaniel Wells do take the best care you can of my loving wife and what she has and if she should be taken away suddenly what she leaves shall be devided amongst these three sons above named hoping they would take care of their deare mother my loving wife Najomy Wells. The persons above said Joseph Maxson and Stephen Randall being witnesses to this will personally appeared before me and gave oath to the above written will and testified that to the best of their judgement how his understanding memory and reason good and had written every part thereof before the signing and sealing thereof. A Cow at 50 shilling, a mare at 30 shillings, swine at 36 shillings, bedding and wearing clothes 20 shillings, spinning wheel 3 shillings, woole 3 shillings, the lumber at 6 shillings, a pot and ____ at 20 shillings, old ___ at 6 shillings, house hold stuff at 6 shillings, flax at 4 shillings, the sum total 8-16-0. To all: Please read this [e mail] carefully, I was surprised to discover this information and have checked and re-checked records. There were two distinct, unrelated Wells families living in Hopkinton, Rhode Island from the late 1600’s into the early twentieth century. I have studied both families over the last ten years and compiled separate family histories because of the confusion over each family. The descendants of Peter Wells lived on the east side of the Tomaquag Brook (river) and the Thomas Wells family lived on the west side of Tomaquag Brook. Both of these families owned large tracts of land and family members lived in close proximity to each other. Large farms were split up to accommodate sons and grandsons, but based on my strong knowledge of property locations, with all certainty never crossed the brook to mix in with the other Wells’. The Thomas Wells lineage is presently documented as follows; Joshua Wells (29 October 1733 – 28 May 1834] with wives, Elizabeth Partelow and Sylvia Bentley, who was the son of Thomas and Phebe (Green) Wells. This family lived on the west side of the river. The Peter Wells lineage is presently documented as follows; Joshua Wells born ca 1770; Joshua Wells (24 August 1743 – ?) wife unknown, who was the son of James and Mary (Barber) Wells. This family lived on the east side of the river. Recently I have taken a closer look at individuals without cited sources, examining Hopkinton’s records for primary sources and recently located information proving each Joshua Wells’ had been assigned to the wrong family. 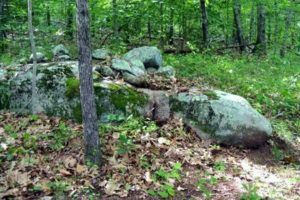 In Hopkinton Land Evidence Book 6, page 408, dated 10 November 1801, a deed selling 90 acres of land, bordering Clarke, Barker and Samuel Wells’ property was sold to a Charles Green, which was located east of the brook. The deed was signed by Joshua and Sylvia Wells of Hopkinton and witnessed by close neighbors, Josiah Witter and Josiah Witter Jr. The deed indicated this Joshua lived on the east side of the brook with wife Sylvia and next to proven descendants of Peter Wells, namely Clarke, Barker and Samuel Wells. The Joshua that married Sylvia Bentley was always thought to be the son of Thomas and Phebe Greene Wells. In Hopkinton Land Evidence Book 3 page 648, 4 April 1789, shows a Joshua Wells giving land to his son, Joshua Wells Jr. The deed description states the land is “the old homestead farm” and is “bounded north by Thomas Wells, east till it comes to Col. Jesse Maxson’s land, west until it comes to the Ashawog River, estimated 50 acres. The same deed description is given in Land Evidence Book 5 page 162 on 9 April 1795, when property estimated to be 55 acres was sold to Thompson Wells, “bounded northerly by Thomas Wells Esq. land, south on Thomas Wells and Col. Jesse Maxson, westerly on the Ashawog River. The deed was signed by Joshua and Phanne Wells of Stonington, CT. This property is on the west side of Tomaquag Brook and right next to the men of the Thomas Wells line and is less than one mile from Stonington, CT. Who was this Joshua and Phanne Wells? The Rhode Island Census of 1774 shows a Joshua Wells Jr, living next to James and Barker Wells (east side of river) with, Males above 16 – 1, males under 16 – 2, females above 16 – 2. The same census shows a Joshua Wells, living next to Edward and Thomas Wells 3rd, (west side of river) Males above 16 -3, males under 16 – 1, females above 16 – 2. An examination of the 1850 census show two Joshua Wells’, both born in Rhode Island, one living in Nelson, Madison County, New York, age 80 years. He was living with a Mary Wells, age 33, born New York and a Ruth Wells age 24, born New York. Several houses away was George Wells, age 50 and his wife Olive Wells. A James Wells, living on the east side of Tomaquag Brook had sons, Robert and George and a daughter Ruth, which would have been the Joshua, (who settled in Brookfield) his aunt and uncles, which would follow naming patterns. But over in Plainfield, Ostego County, New York was a Joshua Wells, age 76, occupation, Baptist Clergyman and his wife Fannie, age 79, both also born in Rhode Island. Tracing the census records back, the ages were consistent in each census, Joshua and wife Fannie were in Plainfield, New York until the 1800 census which places them in Stonington, CT. Comparing land deeds and census records, evidence pointed towards the fact this Joshua and Fannie were the same couple that sold property in Hopkinton, RI on 9 April 1795. In searching Town Council records, more evidence is found to prove that this Joshua’s father, Joshua, was the person that married Elizabeth Partelow (misinterpreted as “Dartts”) on 15 February 1759 in Hopkinton. She was born in Stonington, CT. In Town Council Book 2 page 185, 11 September 1783, “Whereas information hath been made to this council that Joshua Wells and his wife Elizabeth are in such a practice or habit in drinking spirituous liquor and omitting their business that they are likely to spend their estates and become chargeable to the town unless some method be speedily taken to prevent the same. Appointed Guardians, Thomas Wells and Henry Wells.” In Town Council Book 2 page 260, 17 October 1786, “Thomas Wells and his son, Cpt. Henry Wells resigned their Guardianship”. This Thomas would be Joshua’s brother and nephew, respectively. Both lived nearby. It is fairly certain this Joshua, after giving his son land, stayed in Hopkinton and died there after 1783. The deed description of land, and census records directly link this Joshua Jr, who ended up in Plainfield, Otsego County, New York to the Wells family on the west side of the river. It has been assumed by myself and others, that Joshua and Elizabeth (Partelow) Wells had sons Gardner born 20 March 1770, Joshua born 17 July 1771 and Robert born 1781. However, if they were married in 1759, to have a first child 11 years after marriage was unusual. Also, it was assumed that that Joshua and Elizabeth had moved to Brookfield, New York, but Hopkinton Town Council records show otherwise. If the Joshua Wells who was born 20 October 1733 went to live in Nelson, New York and died 28 May 1834 in Brookfield, New York, according to his gravestone in the town cemetery, that would have made him age 101 at death, highly unlikely. However, the Joshua Wells born 24 August 1743 would have been 91 and his wife Sylvia approx. 86 years at death. The Joshua Wells who married Sylvia Bentley was born 24 August 1743 and was the son of James and Mary Barber Wells. The Joshua Wells that married Fannie___ was the son of Joshua and Elizabeth Partelow. Joshua (Sylvia Bentley) Wells (4), James (Mary Barber) Wells (3), Peter (Ann/Susannah) Wells (2), Peter (wife unknown) Wells (1). Joshua (Fannie) Wells (5), Joshua (Elizabeth Partelow) Wells (4), Thomas (Phebe Green) Wells (3), Thomas (Sarah ___) Wells (2), Thomas (Naomi Marshall) Wells (1). Joshua Wells, (1743-1834) the son of James Wells – The records of the First Sabbatarian Church of Hopkinton indicate that Joshua Wells was a member in July 1768 and that he had a first wife, Deborah, who was untied with the Church 22 September 1772. The church records do not indicate when he married the second time, but Sylvia is called his wife 22 June 1786. In the New England Historical & Genealogical Register, “Christopher Clarke and his Descendants” explains the parentage of Sylvia Wells, the wife of Joshua. She was the daughter of Christopher Clarke and his unknown wife. The article states “The marriage of Sylvia Clarke and Joshua Wells has not been found in records, but is definitely proved by three old letters, now in the possession of Mrs. Hay, written by Sylvia Wells, wife of Joshua Wells, to her ‘Dear Sister Sarah’ wife of Carr Northrup. One was written from Hopkinton in 1793, another from Bridgewater, New York (next town from Brookfield) in 1813 and the third from Bridgewater in 1816. Christopher Northrup, (son of Carr) in a letter to his mother from Pittsfield, New York in 1817, mentions a visit to his “Aunt Welles.” These letters also prove the migration of the family from Hopkinton, RI to Bridgewater, New York. Joshua’s will, drawn in 1832 and proved in 1834 mentions his children in two groups of three children each. To Gardner, Joshua and Robert, he left equal portions of his estate, clothing and $10.00 each; To Elnathan, Sylvia and Belinda, he left the balance of his estate to be divided equally, subject to the widow’s bequest. This indicates quite clearly that the first three children were from his first wife and the last three by his second wife. Shortly before his death he added a codicil which disinherited his son, Elnathan, and bequeathed that would have been his to his children, William, Ebenezer, Ann, Gordon and Sally.